Another historically important Piedmontese deck produced by Giordano Berti just arrived in my mailbox. Like Berti’s other productions, this deck is housed in a sturdy handmade box lined with felt and covered with marbled paper. The cards are protected by a sparkling gold bag and are accompanied by a booklet with detailed historical background. Two sets of sheets from the same wood blocks were registered in Turin: in 1829 by Lando and in 1832 by Lando’s widow. This deck is a facsimile of the latter set of sheets. 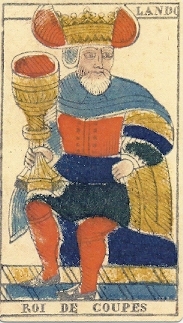 Like most printers, Lando produced a variety of card styles: Tarot de Marseille, Piedmontese, and decks with French suit symbols. 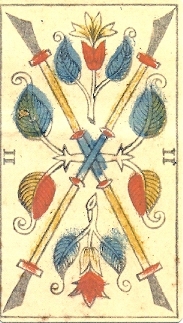 This deck is a Tarot de Marseille Type I with two exceptions: The World card is a standard TdM Type II, and the Pope is a hybrid of Types I and II. Four trump cards have details derived from Piedmont-style decks, like the lion raising his paw on the Strength card, and the Hanged Man’s shoes. (Links below will take you to explanations of the Type I and Piedmont style.) 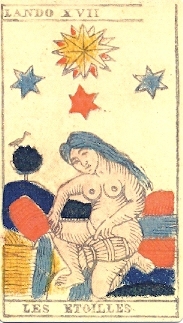 The Star card is unique with only four stars in the sky and water jars of different sizes and colors. “Lando” is printed at the top of every trump and court card, and card titles are in French. This was not a luxury deck. The block carving is only competent, and in many places the stenciled colors (orange, yellow and two shades of blue) were applied hastily. To judge whether a deck is readable, I look at the eyes. I think it’s important for the eyes to be well-defined so you can see the direction of their gaze. This deck gets high marks in that department. A few figures just have black smudges for eyes, but they are a rare exception. The 24-page booklet gives a short history of tarot in Savoy and Piedmont along with an overview of Lando’s output. Most card printers are just names on a box. Thanks to diligent genealogical research by Phillipe Noyes we meet Lando and his family in their social setting. Giuseppe Lando was born @1784 into a family of shoemakers. After serving in the army during the Napoleonic wars, he returned home to Turin and somehow transformed himself into a card printer. After he died of pleurisy in 1831, his widow continued the family business until their son could take over. The Lando family produced playing cards in Turin from the 1820s to the 1860s. This spans the golden age of tarot in Piedmont when large numbers of card makers were printing decks in several styles. They often borrowed or stole each other’s designs, resulting in hybrid decks such as this one with imagery from several types of decks. An unexpected bonus is a little booklet on cartomancy by Giulia Orsini. She gives keywords for all 78 cards plus two spreads. Unfortunately, the text is in dire need of an English-speaking editor. Whenever you see the word “seed” read it as “suit.” The keywords for the 7 and 8 of Coins are identical because a line was repeated. This happens again where two spread positions have identical descriptions. Berti has published three other 19th-century Piedmontese decks (all reviewed here): the luxurious Oriental Foudraz, the refined Perrin, and the elegant Vergnano that won a design award when it was first published. I’m very happy to round out my collection with a deck from Piedmont printed for the average working person.